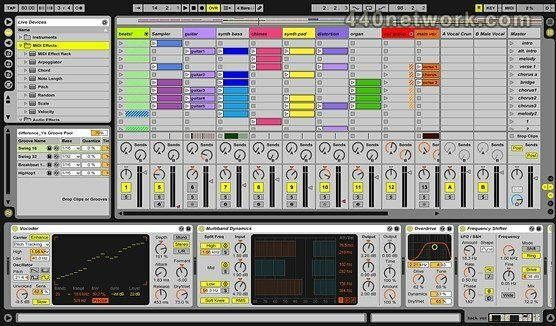 Ableton Suite est la version XL d'Ableton Live, qui contient en plus de l'application Live de nombreux instruments virtuels et bibliothèques de sons. Added user satisfaction survey. After several hours of usage, Live will ask you to rate the software. Added control surface support for Novation Launchkey series. Added control surface support for M-Audio Axiom Air Mini 32. (64-bit Windows) Exporting video at 48 kHz would not work. (64-bit Mac) The video window could go black after toggling full-screen mode on and off. (64-bit Mac) The content in the video window would sometimes not resize correctly in the 64-bit Mac version after when jumping in the playback position. 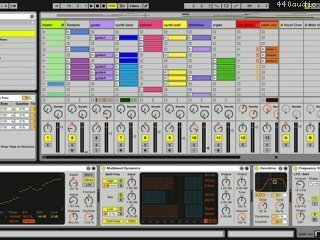 Live 8.4 introduces native 64-bit support. The 64-bit version of Live allows the use of more than 4 gigabytes of RAM. This means that Live users can now work with Live Sets (including Sets using third-party plug-ins and ReWire configurations) that are much larger and more memory intensive than in the 32-bit version. The 64-bit version of Live works with PCs running Windows Vista/7/8 (64-bit) and with Intel-Macs running OS X 10.5 and up. For more information, please refer to our knowledge base: (https://www.ableton.com/articles/what-are-limitations-64-bit-version-live/). Improved the authorization dialog when launching Live as a Trial version. Live would not respond to time signature changes from a ReWire master. Fixed a bug which could prevent VST plugins stored in the OS X system library folder to show up in Live's browser. Fixed a bug in the 32-bit version, which could cause problems when resizing 32-Bit-Cocoa plugins. Under certain conditions, the playback position in audio clips was incorrect after changing clip start markers in unwarped clips and then re-enabling 'warp' (regression from 8.2.7). Deactivating a playing clip and then reactivating it would leave the clip in an incorrect state. The clip would look as if it is playing, although it was actually stopped. Fixed a problem with the Max for Live engine, which would cause Live to freeze when setting an audio buffer size smaller than 21 samples. Live parameters would no longer update correctly after deleting a Max for Live device which was mapped to that parameter via live.remote~. Mappings from Max devices to VST plugin parameters could get lost after saving an instrument rack preset and then reloading it. Fixed a graphical glitch in the Session- / Arrangement View amoeba after toggling views (mixer, crossfader, etc.). The Session View selection frame of the APC40 or Launchpad could get stuck after deleting scenes or undoing the creation of scenes. Under certain conditions, Live could hang when decoding MP3 files (Win only). Fixed a bug which could cause a "memory corruption error". Fixed a memory leak which could occur when previewing audio files in the Browser, using the "Complex" warp mode. Live could freeze when successively sending Program Change messages to a VST or AU plug-in (Mac OS X only). Live could freeze when using the "Insert Time" or "Insert Silence" commands. Live would crash when deleting a clip while recording. Live would crash when saving an Audio Effect Rack containing devices with certain side-chain routings. Live would crash when dropping MIDI Effect Rack presets onto Drum Rack pads or an Instrument Rack chain. Live would crash when changing the sample rate for audio interfaces with dynamically changing channel configurations (Mac OS X only). Live would crash when using the copy / paste time commands inside a group track. Live could crash under certain conditions when importing extremely long MP3 files into Live (several hours long files). Live could crash under certain conditions when deleting a VST plug-in from a drum rack's return chain. Live could crash under certain conditions when recording time signature changes. Live could crash under certain conditions when triggering scenes containing time signature changes. Live could crash under certain conditions when switching through rack chains (e.g. with the "Auto" select function) whilst renaming a device inside the chain. 3 other rare crashes have been fixed. Fixed a bug which could cause a "memory corruption error" when launching Live. Fixed a memory leak which could occur when using the "Complex" warp mode. Live device parameters would no longer update correctly after deleting a Max for Live device which was mapped to that parameter via live.remote~. Fixed a problem with the Windows installer which could lead to an incomplete installation on some computers. Symptom: The Live application would not launch at all and an error message "The application has failed to start due to a side-by-side configuration error" would be shown instead. Under certain conditions, the playback position in audio clips was incorrect after changing clip start markers in unwarped clips and then re-enabling 'warp'. Fixed a bug which prevented some VST plugins stored in the OS X system library folder to show up in Live's browser. Bugfixes:Minor changes for usage data reporting. Fixed a bug with the Rewire engine which occurred with Live 8.3.1. Added support for Mac OS 10.8 "Mountain Lion". Improved performance when recording many MIDI CC data into MIDI clips. The default takeover mode for control surfaces has been changed to "none" (this will only affect new installations). Minor changes for usage data reporting. Fixed a bug which could lead to degraded resolution of automation data when recording automation for VST plugins running in Novation's automap shell. Fixed a bug which prevented samples from being opened in an external sample editor. Fixed a crash which could occur when importing two identical audio files into Live. Fixed a bug which could lead to two undo steps when freezing a track. Fixed a bug which could cause the save dialogue to disappear in OS X Lion. Under certain conditions, Live's splash screen wouldn't appear on OS X Lion. Opening an alias file of a Live set wouldn't work on OS X Lion. Fixed login problems in the Soundcloud uploader on Windows. Fixed a rare crash which could occur with automatic updates on certain Windows computers. A new "Upload to SoundCloud" option is available in the Export Audio/Video dialog. When enabled, Live will open an upload client after the file has been rendered to disk, so you can upload the rendered file directly to your SoundCloud account. Added automatic software updating. When enabled, Live will automatically download and install software updates in the background. Users who update to Live 8.3 from an older Live version will see a dialog box when launching Live 8.3 for the first time, where Automatic Updates can be enabled or disabled. You can always change the settings in Live’s "Licenses/Maintenance" Preferences. More detailed information about Automatic Updates is available in our Knowledge Base. Changed the naming of the Live application. The application is now called "Ableton Live 8" and does not include a specific revision number. The revision number can still be found in the About screen in the Help menu. The Windows installer has been updated to a newer version. The default installation path of the Live application has changed on Windows. More information can be found in our Knowledge Base. Added usage data collection. When enabled, Live will send data about your Live installation and usage to ableton.com. This data will be used to help our developers identify bugs and improve the software. Usage data collection is optional and can be enabled/disabled in the "Licenses/Maintenance" Preferences. More information can be found in our Knowledge Base. Added control surface support for Akai MPK Mini. Fixed a crash that could occur when modulating a parameter in the Corpus device with Max for Live. Fixed crashes and audio dropouts that could occur when hot-swapping through AAS instruments. Fixed a crash that could occur when undoing the deletion of the last warp marker in an audio clip. There is a new entry in the Options menu: "Reduced Latency When Monitoring", which toggles latency compensation on and off for tracks which have input monitoring on. When enabled, input-monitored tracks will have the lowest possible latency but may be out of sync with some other tracks in your Set. When disabled, all tracks will be in sync, but input-monitored tracks may have higher latency. Before, the option was only available via the 'StrictDelayCompensation' options.txt, and was ON per default. It now defaults to OFF. When restarting after a crash, Live will now display a warning in the Help View if the crash was caused by an issue with a VST plug-in. Note: this is currently for Mac OS X only. Authorizing a full version of Live would sometimes activate a feature-limited version (Live Lite or Live Intro). Fixed a bug that prevented setting the start marker of an audio clip before the sample start. On Mac OS X, saving a Live Set could lead to an unresponsive Save dialog box, if the destination folder contained an alias file which points to an unavailable volume. Fixed a crash which occurred when importing a Drum Rack with a routing to a return track. 3 additional crashes were also fixed. In Live 8.2.5, it was not possible to try Amp or Max for Live. Known issue: As of 10.7, Java is no longer installed by default on Mac OS X. In addition, there is a bug that can cause applications that require Java to crash. This affects Max for Live; when a user tries to open a M4L device that requires Java, first Max, and then Live, will crash. We have worked on a fix for this on our side, which is available in this latest build, but the fix is not yet available in Max. Cycling '74 will release a Max update shortly with the fix. For now, users with Max for Live should install Java separately if it is required by their devices, to avoid the crash. Imported tracks (from the Live Browser) now route to Master if their original output routing can't be resolved, instead of "Sends Only." The default for the Takeover mode in the MIDI Preferences is now Value Scaling instead of Pick-up. We now prevent choosing the root of the system hard drive (or the Windows system folders on Windows machines) as the third-party plugin location. Doing that would crash Live on startup, because these folders contain files that are interpreted as third-party plugins. Live would freeze and crash on OS X Lion when sending MIDI data to any MIDI port. Under certain conditions, quantizing transient markers could lead to overlapping warp markers, which would cause various problems when editing the warp marker or its segment BPM value. Under certain conditions, the "Transient"-based Beats warp mode would play double attacks. With this bug fixed, it is possible that some clips sound different. Excluding a plug-in from the scan process didn't work if Live crashed because of the first scanned plug-in, after enabling the VST plug-in source via Live's Preferences (Mac only). Rendering a Live Set containing an EQ3 at sample rates below 44.1 KHz would result in an audio file containing pure silence. Fixed a crash when loading a Live 7 Set with invalid clip color information in Live 8. Detail view appeared empty after Hot-Swapping an unfolded Rack, because devices were scrolled out of view. Infinitely long clips would be created if rewinding the global transport while making a new recording. Track names could be incorrectly displayed when unfolding a Live set in the Live Browser. This only happened for "automatic names" that tracks get from the Instrument they contain. For Live Sets saved in earlier versions, names of tracks containing Racks, Max for Live devices or third-party plugins may still look wrong. Re-saving the Sets will fix the problem. Some Operator presets could sound different when loading them, and then creating or moving a track. The Frontier Design Tranzport was not getting updated when switching tracks. The green zoom button was sometimes disabled when using Live with Mac OS X. Resuming a clip in Session view while the track is armed but OVR is OFF could result in the clip not playing its notes. Certain Library content wasn't usable for Live Intro users since version 8.2. Enabling a clip loop via the loop switch or the Set Loop Length button would sometimes stop the clip. Fixed a crash which could occur when hot-swapping a certain Drum Rack pad. Eleven additional crashes were also fixed. * Added bank names for Amp instant mapping, which in turn fixes a problem with the Axiom DirectLink control surface. * Fixed problems with the Mbox2 related to non-integer sample rates. * Added control surface support for Akai Professional LPD8. * From now on, betas will ask to check for updates only once a week, and starting a week after first run. * There is now a simple way to observe the selected parameter via the Max for Live API, using "live.path live_set view selected_parameter." This can be used, for example, to build a custom "map mode" to quickly map parameters in your Live Set to controls in a Max device. * Live objects like tracks, clips or parameters retain their identity (id nn) during operations like move, save/restore, cut/paste, delete/undo, the identity is global and can be communicated via Max's Send and Receive objects. * live.object, live.observer and live.remote~ are now able to remember their target objects when Live sets or presets are saved and restored or when objects are moved within the Live set. * Mapping some mixer component on the APC40 (for example) through the Max for Live API wouldn't work without pressing the Pan or Send button on the APC40, which reset the component. This has been fixed. * "goto live_set tracks 2 devices" in a set with one track produced id -1, which is wrong. Now it produces id 0. * If the LOM id of the observer is persistent, the property of an observed LOM object is persistent, even if it is dynamically changed using a message. * Max for Live devices that control the Application objects (e.g. live_app (live_app view)) or which get information about the Live version and document name (e.g. get_major_version (focus_view)) will work when loading the Set, without requiring user interaction. * Fixed a problem with nested Macro mappings when the range of a mapped ON/OFF switch, or of a selector switch (such as a filter type switch), is not at default values. In such a case, the right value would be displayed, but the wrong value would be used internally. Note: with this fix, you will now hear what you see, although this may mean that previously saved Sets that contained the bug may sound different. * Deleting time in the Arrangment View could delete crossfades in certain cases. * When using an APC40 and Scratch Live, Scratch Live would sync to the APC but would not initially show the return tracks . * If the VST plug-ins folder contained shorcuts/aliases to files in another location on disk, the folder would be rescanned each time Live starts. This has been fixed. * When launching a scene with via Key/MIDI mapping or a control surface such as the APC40 while "Select on Launch" is enabled, the Master track became selected. This would result in the selected device switching to the device on the Master track. Now, launching a scene via remote control behaves the same as when launching with the mouse; the device selection doesn't change. * Fixed a crash that could occur when clicking the status bar, while it displays "Media files are missing", and just after having adjusted a Macro knob. * Fixed a crash that occurred when adding an audio clip, scrubbing in the clip detail view, and pressing Undo while the mouse was still down for scrubbing. * Improvements to Amp presets including better folder organization, additional guitar and bass amp presets and various other changes. * Improvements to sound quality in Drum Machines. * Performance optimizations on many Rack presets. * Many delay devices now use the "Fade" Delay Transition mode, to avoid clicks. * All Latin Percussion sounds are additionally available as chromatically tuned Simpler presets. * Amp is now available in the trial version of Ableton Suite. * Removed duplicate Amp presets. * Fixed Hot-Swap behavior for a number of Session Drums and Drum Machines presets. * Fixed a bug that prevented the use of soundcards with only one input on OS X. * Fixed a crash that occurred when using a ReWire slave such as Reason and manipulating devices in the slave that were referred to by clips in Live. * Support for The Bridge, our collaborative project with Serato. The Bridge is free for users of Live/Suite 8. * Amp, an audio effect that models guitar amps and cabinets. Amp is free for Suite users. * Some changes were made to the Help Pages regarding how to report a crash and how to contact support. When restarting Live after a crash, Live produces a file named "Ableton Crash Report... .alp", whereas choosing "Get Support.." in Live's Help menu produces a file named "Ableton Status Report... .alp". * Improved compatibility for Antares Harmony VST. Now the plugin works in Stereo mode only when inserted in a track, while previously its 5 channels were active in such a case. * Fixed a bug that could prevent Live from deleting temporary Projects. * Fixed a rare crash that could occur with a combination of control surface selected in the Preferences, Ableton devices moved from track to track, and then tracks moved to different positions. * Fixed a crash that could occur after undoing the move of a track containing a clip into a group track, which occurred with a specific state of the Live Set. * Fixed a crash that could occur when entering mapping mode while a Max for Live device was in the clipboard. * Fixed a crash that occurred after triggering a 'stop slot' and recording outside the punch region. * Fixed a crash happening after pressing Del (return to default) after editing the volume of at least two Rack chains at once. * Fixed a crash that would happen while Live is slaved, and opening a Live Set containing a MIDI clip ready to Overdub, which would try to be triggered when loading the Set, before the undo history is ready. * Fixed a bug that would create corrupt documents if the user uses 'Save a Copy' but overwrites the original Live Set, then tries to restore that Set after a crash. Now, overwriting the current Set using 'Save a Copy' does the same thing as 'Save'. * Fixed a crash that occurred while remotely changing scenes while editing some clip property. * Core Audio driver is now listening for external sample rate changes, on the Mac. * Fixed a crash that could occur after undoing the pasting of an Instrument into an empty MIDI track. The crash could happen in other ways too, but that's the easiest to describe. * In some cases Live could crash when loading a document that overcomes limitation (like a Live set containing Operator on a computer where Operator is not unlocked). * It was previously not possible to map a track group slot when the group track was unfolded, because the selection spreads over the whole local scene. Now the selection changes upon entering map mode, or when existing it, allowing to map the slot, and restoring the correct selection when done. * Fixed a crash that happened when moving a Max for Live device containing a "getpath" object to another track. * Live could hang changing clip parameters while jumping in the song while recording. * On some systems, Live is able to create Live packs that exceed 2 Gb, but could not read them. This is fixed by upgrading our packing Libraries. * Fixed a crash that happened in rare cases (revealed by using The Bridge, but it is not directly related to it) when trying to insert a first warp marker in an audio recording. * Fixed a crash happening when some MIDI targets where not available anymore but called. For example, it happened when having 2 MIDI clip selected in Session view, in a track containing at least a device, and then flattening the track. * Fixed a crash happening when rebuilding the set from the Undo history, related to 3rd devices. * Disabled editing the value of a VST plug-in parameter via the computer keyboard (only in the Ableton view of the plugin, not in the plugin's own interface). The VST specification doesn't allow Live to set the value correctly. * Fixed a crash that happened on a Mac whenever the number of channels for the opened audio interface would change. For example, changing the sample rate for some devices would implicitly change the number of inputs and/or outputs. * Fixed the drawing of notes while recording a MIDI clip in the Arrangement view. * Fixed many issues that caused memory corruption when using Complex Pro. A bug that made 192Khz files sound distorted when stretched with Complex Pro has also been corrected. * Fixed a crash that could occur when uninstalling a Live Pack and making the Library unavailable, by unplugging the external drive it is on, for example. * Fixed crashes that could occur when using sample files that have a sample rate greater than 192KHz and set to Complex or Complex Pro. * Fixed a crash that happened when using "dead keys" in message boxes, like pressing "z" when the "Do you want to save this Live set" dialog box was displayed. * Fixed a crash which was triggered by moving a fader or knob on a MIDI controller while in MIDI learn mode, and quitting Live at the same time. * Fixed a crash happening when having an incoming MIDI mapped message that would reach Live while loading a document. This had to do with the Undo history not yet being created, while the incoming message needed to access it. * Fixed Japanese text input. It was not possible to rename tracks with Japanese characters, for example. Unwarped clips could be placed incorrectly after opening a Live Set, if the Set was saved after changing the global tempo without first confirming the change with the Enter key or by clicking somewhere else in the interface. Fixed a visual bug that made MIDI clips entirely black while recording, but before the first note was input. Fixed a crash when observing 'has_stop_button' of a Group Track Slot via M4L GroupTrackSlot. Fixed a crash that occurred when loading a Group preset containing an AU plug-in that is missing. Fixed a crash that could occur with clips warped in Beats mode, Transients and back-and-forth envelope settings, when the loop extends outside the sample data. Fixed a bug where typing a tempo in the BPM field of a warped clip would give a slightly wrong number (i.e. you type "100" and "100.0001" gets entered," which led to some neutrality problems. 3rd party plug-in windows now always get the focus when clicked. Blocked certain keys when a 3rd party plug-in window has the focus, such as the "Delete" and "Backspace" keys, which fixes the bug that would delete a plug-in or a track when pressing Delete/Backspace while editing a 3rd party plug-in in its own GUI. The Min or Max parameters in the mapping Browser, for mapped 3rd party plug-in parameters, could lose the focus as soon as they were touched. This made it impossible to edit them via the computer keyboard arrow keys. The Ableton GUI of an AU plug-in would be empty after loading a native AU preset, for plug-ins having fewer than 32 parameters. In such a case, the GUI should be automatically populated. Fixed a bug that prevented removing a parameter from the Ableton GUI of a 3rd party plu-gin while Configure mode is ON, if it was Macro-mapped. Dragging a first warped clip in a non-empty Arrangement would sometimes set the tempo of the Live Set. The correct condition is that this should only happen if the Arrangement contains no clip at all. It was not possible to click inside a multi-selection while in Key or MIDI map mode in order to change the selection and select only one of its constituents. This is now fixed. Fixed another key handling problem for some plug-ins using a Cocoa view. Fixed a bug where MIDI notes could hang if an AU plug-in was deactivated and then reactivated. If the last note within the Loop brace, in a MIDI clip, overlapped the Loop end, selecting the loop brace and choosing "Duplicate" would duplicate the looped material's offset. Now duplication correctly duplicates the Loop length, at the correct position. When an External Instrument was routed to a multi-timbral MIDI instrument, and that instrument or the containing track was moved, the routing would be reset to the default output. Now routings are correctly remembered. Improved audio streaming performance for specific Live Sets with many audio files. Corrected a bug that would make computer keyboard selection behave incorrectly after selecting a clip via remote control. Fixed crash when mouse was pressed in the detail view before sample analysis finished. Fixed crash when dragging MIDI from XLN's Addictive Drums. Fixed a crash that occurred when zooming into a large waveform with an extreme zoom factor. Fixed a bug that made Collision silent after deleting it and undoing. Combination Mode is now active when multiple Akai APC40/20s are in use. This means that the topmost controller selected in your preferences will control tracks 1-8, the second controller selected will control tracks 9-16, and so on. When an APC40 and an APC20 are connected at the same time, the APC20's buttons will default to Track Selection, and its faders will default to volume. Fixed a bug that caused the Drum Machines LD Live Pack to not work in Live Intro. Fixed a rare crash that could occur when deleting a Drum Rack pad. Fixed a crash that could occur when moving a track with an automated parameter that is also MIDI mapped. In very rare cases, Live would crash when running extremely loud signals through Overdrive. Custom Min/Max values for MIDI- or key-mapped parameters on VST plug-ins would be lost after saving and reloading the Set. Some Sets which were saved in earlier versions of Live could not be opened in recent versions. Dragging a sample onto the waveform of an existing clip in Session view would reset the Launch settings of the clip. In certain cases, launching a warped audio clip would play the unwarped version simultaneously. In some cases, Gate launch mode for Session view clips would not behave correctly. In certain cases, conflicting fade and volume envelopes would inadvertently mute audio clips in the Arrangement. Occasionally, loud clicks could occur when using crossfades in the Arrangement. When recording into the Arrangement, clicks could occur when "Create Fades on Clip Edges" was enabled. In certain cases, clicks could occur when turning on the filter in Sampler/Simpler while holding a note. The faders on the Mackie Control would not behave correctly when volume is automated in Live. Fixed a bug that would cause automation to always be overridden when using Ultra Analog. This would result in the Back to Arrangement button becoming active. In some cases, the dialog box that should show trial options when starting Live without an authorization would be empty instead. On OS X, missing media files without a file extension could not be replaced. In certain cases, a dialog about temporary files would be shown even though there were no temporary files. Fixed a rare crash that occurred when opening documents while the mouse moves in certain areas. Fixed a crash that occurred when dragging a Live Set which contains a sample that has been shortened outside of Live to the Session view, while this sample is already in use in the Arrangement view. Fixed an issue in which configuring a third-party plug-in by clicking one of its parameters in the plug-in GUI while Configure is ON would not show the right value for the parameter in the Live GUI of the plug-in. The APC 40 wouldn't always update its state properly when loading a new Live set. Live could hang when undoing the deletion of a parameter mapping in the Live GUI of a 3rd party plug-in. Fixed a crash that occurred when firing a scene while moving a Group Track. We now ignore "non automatable" parameters for AU plug-ins, in terms of assigning them in the Live plug-in GUI. Fixed a rare crash that could occur when loading a new song or quitting Live while the mouse hovered a Max for Live device. Using the Launchpad as control surface and additionally for manual mappings would not always work properly. Using the pads of the Akai MPD18 would not work properly. Using Novation's Launchpad, when switching between Automap and Live control would not work properly. Loading a Max device would crash if Pluggo was already active. It would not be possible to create a new Project in the File Browser if the root is set to 'Workspace'. Receiving an invalid parameter index from Max could crash Live. Having a Max device sending many blob changes during saving could crash Live. On Mac OS X, under certain conditions, making Live the foreground window could lead to a crash.